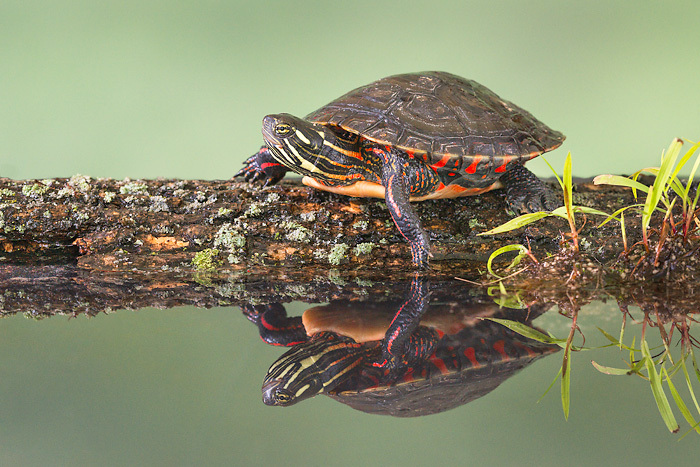 Pictured is the winning image of a midland painted turtle, which was the top photo out of 143 entries for the fifth annual Ohio Wildlife Legacy Stamp Photo Contest. Sharon Cummings of Graytown, Ohio, captured the image to win the contest. COLUMBUS — The Ohio Department of Natural Resources (ODNR) announced a reflective image of a midland painted turtle photographed by Sharon Cummings was selected as the winner of the fifth annual Ohio Wildlife Legacy Stamp contest, The photo will appear on the 2014 Ohio Wildlife Legacy Stamp, which goes on sale March 1, 2014. This is the second time that Cummings, of Graytown, has won the stamp competition. Her image of an Eastern amberwing dragonfly was selected for the 2011 Ohio Wildlife Legacy Stamp. The theme for this year’s contest was Ohio’s many native turtle species. Midland painted turtles are among the most abundant turtle species in Ohio. They are often spotted basking in the summer sun along the banks of many bodies of water. It has a deep green carapace with a red and yellow pattern along the underside, and the head and legs also have red and yellow markings. Second place was awarded to Brad Imhoff, of Mt. Vernon, who also photographed a midland painted turtle. Lois Hobart, of Newcomerstown, earned third place with a photo of an Eastern box turtle. The Ohio Wildlife Legacy Stamp contest is only open to Ohio residents. The ODNR Division of Wildlife received 143 entries of turtles from 83 photographers. The contest was judged this year at Geneva State Park during the Wildlife Diversity Partners Conference, Sept. 4-5. The judges of the photo contest were representatives from statewide conservation organizations, metroparks, science and education centers, as well as wildlife biologists, naturalists and outdoor writers. Photos were judged on originality, technical excellence, composition and overall impact. Fourteen dollars of every $15 Ohio Wildlife Legacy Stamp sold are invested in the state’s Wildlife Diversity Fund. This fund supports habitat restoration, wildlife and habitat research projects, creation of wildlife educational materials, and efforts that restore and conserve endangered and threatened species. No state tax dollars are contributed to this fund.